I love museums. I like to put my ipod on and wander around alone, allowing myself to really get the full experience of the art. It feels like I’m connecting to not only the piece of art itself, but to the artist and his or her experiences and emotions. 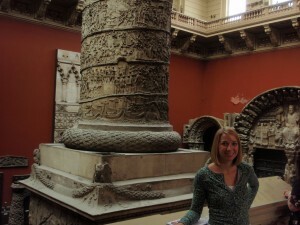 On Saturday, Amy and I took the tube to Charing Cross to visit The National Gallery. There we proceeded to immediately get lost in the extensive building, but we weren’t complaining. We wandered through room after room that held amazing works by Rembrant, Van Gogh, Monet, Leonardo da Vinci, Cezanne, and Turner, just to name a few of my favorites. I compared this museum to the Met in NYC: both are enormous, well cared for, and very popular. However, I noticed a key difference. This difference is simply that most museums here are free, with a just a suggested donation, unlike the Met which charges 10$ per visitor. I love that England honors the historical and cultural value of artwork by making it accessible to the general public. Not only could I observe famous works of art, but I could also examine the evolution of religious practices, social castes, daily life, and even fashion free of cost. This is a pretty good segway into discussing the museum I visited today: the Victoria and Albert Museum, commonly referred to as the V & A. As a small group, we left from Euston Station to take the central line directly to South Kensington where the tube conveniently led us straight into the museum. At first, I really didn’t know what to expect of this experience…I mean, I know very little about fashion and I simply wasn’t sure how I was going to be able to relate to the displays. Yet, as is often the case, I was pleasantly surprised. I walked into a room filled with some of the most beautiful sculptures I have ever seen. 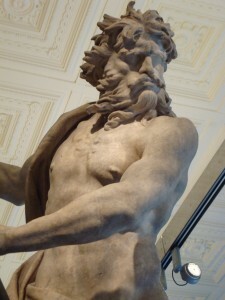 Though I had never heard of most of the sculptors, I was able to get really close to each of the statues and really examine the detail and expression in each. With my head phones in and the world tuned out, I strolled around. There was a huge exhibit on the evolution of clothing, another on shoes & accessories, another on fashionable metal-ware (pots, religious idols, masks, etc). It was really cool to see how our everyday lives have been affected by the trends of the past. We often hear that things are “out of style” or “not in fashion anymore” but have we really stopped to contemplate what that means? Fashion is constantly fluctuating and changing and all of us, (whether you consider yourself fashion forward or not), are players in this game. We ourselves are walking works of art, displaying the genius of designers as they mold trend after trend, mixing past and future to create something entirely new. And that, at least to me, is fascinating. 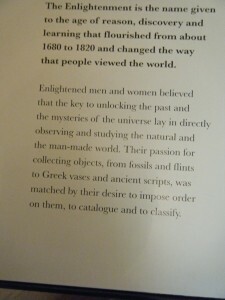 The thought that I am connected to the past through the evolution of fashion really intrigues me and I would never even have noticed this unless I’d visited the V& A museum! Another exhibit that I thought was amazing, literally AMAZING, was located in the main lobby of the museum. It was called “Telling Tales; Fantasy and Fear in Contemporary Design” created by international designers Tord Boontje, Maarten Baas, Jurgen Bey and Studio Job who were all inspired by the classic fairy tales which they then translated into their construction offurniture. I know it sounds almost comical (like really, how can furniture be at all interesting) but I’d never seen anything like it. I posted a link a little further down that gives you a little tour. Also in this exhibit was a frightening, but brilliant, room that entitled “Heaven and Hell”. I won’t give all of it away because I cannot adequately describe it, but the link below also can give you an idea of what to expect. However, I will say this, the lighting, color, back drops, music, and the positioning of the art are all major contributors to the overall effect of the art and are carefully constructed by the artists/museum staff. Basically, see it in person because you won’t regret it. This exhibit only lasts until October 18th, and I suggest everyone see it while here. Truly, both the National Gallery and the V&A are exceptional and I really enjoyed having the opportunities to both observe and reflect on my experiences. Whatever happened to resting in peace? 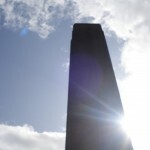 Every civilization constructs themselves in unique ways, develops rituals, cultural symbolisms and folklore depending on the values, morals and believes of either a powerful minority or the general population. When I visited the British Museum today I was at awe at the number of Egyptian objects on display and could not help but to inquire about their present state. I know this is a museum and the point is to display objects of interest to the general public, after all that is how revenue is made and popularity is obtained, the “weirder” the object the more people that want to come see, but why? I realized that museums practice a form of cultural fragmentation, they present to the audience a piece of a culture/civilization, the one that we (as the audience) will be most intrigued by; again, but why? why are we always fascinated with that which is different from the things that we know (as “normal”)? What makes us so superior that we have taken the right to place other cultures on display as if they were commodities? 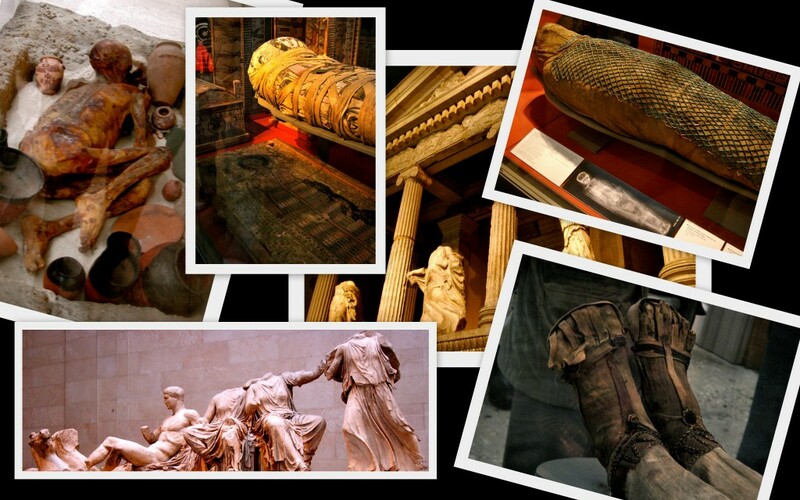 Thousands of years displayed in one room, objects preserved for a lifetime and …mummies on display? Whatever happened to resting in peace? If Egyptians believed in placing specific objects in the tombs of their pharaohs for the after life then guess what, we have totally screwed up thousands of years of ritualized mummification for the sake of cultural representation. For as silly as this may sound I was a bit saddened to realize that if Cleopatra came back in her after life she would have no wealth, it has been divided among different museums and collectors all overt eh world. Her mummy was assigned a resting place, a burial ground, for a reason, and by removing her from that environment we have damaged the fabric of one of the world’s most intricate civilizations. How dare we disrupt the living dead? How dare we destroy sanctuaries, transport them across the globe, and study them as if they were meant to be objectified in the first place. Although, I was extremely impressed at the sculptures of the Parthenon (located at the exhibit on Greece at the British museum), once again I asked myself: Why are these magnificent structures here? Why are they not at the Parthenon where they belong? Later in the day I learned from on of my classmates that it’s a complicated history which most of us know nothing of. She explained to me how parts of the Parthenon were being stolen from their original site, and so someone “rescued” pieces in order to preserve what was left of it (these are some of the pieces on display). Ok, just maybe some of the objects displayed are righteously justified, but my questions still stand: why are we always fascinated with that which is different from the things that we know (as “normal”)? What makes us so superior that we have taken the right to place other cultures on display for our own leisure? The questions remain, why display mummies when they were not meant to be exhibited (all over the globe) in the first place?Why do we commodify other cultures, fragmentize them and appraise only a part of them (the part that has been given to us)? Again, every civilization constructs themselves in unique ways, develops rituals, cultural symbolisms and folklore depending on the values, morals and believes of either a powerful minority or the general population. What are we constructing that will be on display a thousand years from now? Would you like to see the complexities of your life minimized to a single cardboard wall (or a short movie clip), on some museum, set up for judgement? Would you like your body to be preserved, put up for auction, displayed on a gallery without your consent? Think about it, how would Cleopatra feel if she was to rise from the dead to tomorrow to find herself in a glass box, on a different continent, far from anything know, separated from her wealth and objects provided to her inside her tomb upon her death? “A culture is made– or destroyed– by its articulate voices” (Ayn Rand, Russian born American writer and novelist). A plaque in the British Museum tells us, “Enlightened men and women believed that the key to unlocking the past and the mysteries of the universe lay in directly observing and studying the natural and the man-made world. Their passion for collecting objects, from fossils and flints to Greek cases and ancient scripts, was matched by their desire to impose order on them, to catalogue and to classify”. Let’s put on our mathematics hats on and visit the transitive property for a second. Math isn’t my strong suit but I think it works. People from the Enlightenment believed in prospering and discovering more about the world around them by collecting ideas from others. The English people have prospered and discovered more about the world around them by collecting ideas (and goods as demonstrated in the museum itself) from others. Can we not substitute the English for the people in the Enlightenment then? By my understanding of the transitive property we can. 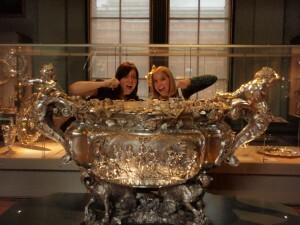 And if we do that, the British Museum puts the British people on display fantastically. Our class seems to be throwing around ideas about how British the British Museum really is. I’ll try to give the topic as good a go as the rest of the class has done. I think the British Museum is actually the perfect name for a museum that showcases a country that has borrowed or stolen ideas from other cultures from which they can prosper by showcasing artifacts that they have borrowed or stolen from other cultures from which they prosper. That’s an incredibly wordy way to say that the name fits because Britain itself is a lot like the exhibits the museum has: a forum of borrowed ideas and items. Not convinced? Look around at the people who are at the museum. First off, it’s incredibly crowded. Good luck getting through to see the Rosetta Stone, Cleopatra’s artifacts, the Easter Island statue, or the dancing Shiva. The crowd doesn’t simply consist of British people admiring what they have taken from other cultures. Walk through the crowd and listen to all the different languages that surround you. Chinese, Japanese, Russian, French, something that sounds like Hebrew, and, of course, English- you name it, you’ll probably hear it. Aware of this, the museum offers all of those languages on all of its important postings so that everyone who visits can navigate the museum as easily as possible (which, due to its size, isn’t very possible despite the amounts of maps available for use). As soon as you step out of the museum, you see a hot dog stand and a macadamia nut vendor and feel very much in ‘British’ London. But look around at the surrounding shops and restaurants on surrounding streets. Again, there are multiple Chinese, Thai, Indian, French, and Middle Eastern places all within walking distance (if not eyeshot) of the museum. Not only are these populations present in Britain today but they have also been influential in British history for quite some time. We’ve discussed in group discussions how today’s Britain has been shaped by the colonies it’s imperialized, by the countries it’s traded with. For years, Britain has been formed by borrowing ideas from other countries- it only makes sense that the British Museum would be composed of the work of other countries as well. In that vein, the British Museum is incredibly British in my mind. So if the museum is British and thus displays the British quite intensely, I’m interested in what the museum wants us to deduce from the exhibits. What does the museum think is British and how does it want to display the culture to us? Clearly, it wants visitors to see a culture that is rich in intellect, has an appreciation for the arts, and is open and proud of its diversity. I would argue that that is in line with what Britain wants to portray itself as to the world: a welcoming place in which diversity can thrive. As our last class discussion demonstrated, the success of that endeavor is debatable to say the least. 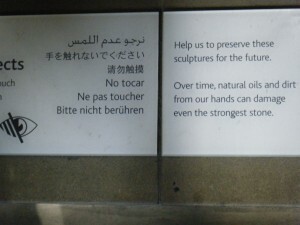 But the museum at least strives to guide everyone through its walls in as equal a way as is possible by listing so many different languages on its signage. Maybe if we look hard enough, that same helping hand might be around the city as well. Maybe. Just don’t get swept away in the crowd while trying to spot such a sign. There are a total of eight Royal Parks within all greater London: St. James’s Park; The Green Park; Hyde Park; Kensington Gardens; Richmond Park; Greenwich Park; The Regent’s Park and Bushy Park. Thus far, I have visited three of these: St. James’s Park; Greenwich Park and The Regent’s Park. Each park was very different, yet shared a similar history. St. James’s Park, originally created by King Henry VIII as a personal deer park for hunting, is located in Westminster. The park has been remodeled several times, including once for King Charles II in the 1600’s and again in the first half of the 1800’s by John Nash. The closest tube stops include Piccadilly Circus, Charing Cross and, of course, St. James’s Park. This park is absolutely massive. You could easily spend an entire day here. Perhaps the most interesting feature of this park is its wildlife. 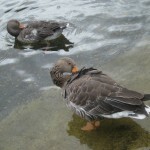 There were waterfowl of all kinds paddling and preening in around the long lake that stretches through the park and placards along the way that discussed each species. The asphalt walkways circling the lake contain markers that indicate that the Princess Diana Memorial Walk trails through the park. With all the flora and fauna found inside St. James’s Park, it only seems appropriate to commemorate one of Great Britain’s most beloved members of the royal family here, amidst such beauty. St. James’s Park is a popular spot for tourists and locals alike. There were many families, especially, snapping pictures of the scenery, but also native Brits jogging or enjoying lunch or a book in the park. What I did find interesting was that there were very few non-whites in the park. I remember seeing one tourist family of what appeared to be an Indian descent inside the park, posing for family snapshots by a knotty tree, and a two black women with strollers and little, skipping girls around the age of five, who walked along the sidewalk on the outskirts of the park, but never entered it. Greenwich Park is equally interesting. We walked through this park on our way to The Royal Observatory, which is located almost in the center of the park. 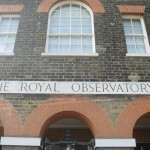 The Observatory was commissioned by King Charles II (see hyperlink above) in 1675 and was designed by Christopher Wren, the architect who was responsible for countless famous buildings around London including St. Paul’s Cathedral and others circa the Great Fire of 1666. 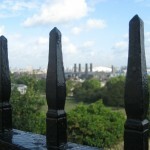 The park is inaccessible via the tube, but many buses such as the 188 and 53 run through Greenwich at frequent intervals. This park, which is divided by the Prime Meridian features much more open space than either St. James’s or The Regent’s Park. There are large expanses of lawns – slightly browning in areas – with trees dotting the landscape throughout, but no fences, hedges, walls or other structures that create intimate spaces within the park. As we walked through the park I noticed many families and couples strolling through the park, and several joggers. There was a friendly yet rather skinny dog sniffing around the sneakers of several students. He carried a ball in his mouth and seemed to plead with his icy blue eyes for a playmate. He wandered around without direction and I wondered if he was blind, or homeless, and watched the ribs shift under his taut skin. The abandoned dog, the slightly sunburned grass and the lack of flora cast a feeling of melancholy upon me as I walked through the park. 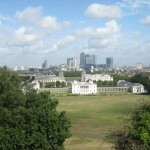 I didn’t feel joy or peace in Greenwich Park as I did in St. James’s or The Regent’s Parks. Even the view of the city from the top of the hill upon which the observatory is situated depressed me. It is a view full of skyscrapers, power plants, power lines, smoke stacks no longer in use. When I am in the city for too long, I crave green space, but in Greenwich Park, I found myself preferring the city. 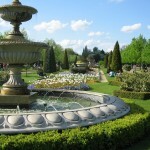 The Regent’s Park, located between Paddington and Camden Town, is accessible via several tube stops, including; Marylebone, Great Portland Street and, of course, Regent’s Park. The park was originally another of King Henry VIII’s deer gardens (see hyperlink above) and features the Queen Mary’s Garden, an area of the park blooming with over nine thousand begonias. 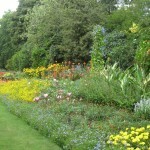 The Regent’s Park is one of the most stunning places, if not the most, I have been lucky enough to visit in my life. 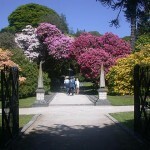 The walkways reach out through rows of shaped cylinders of shrubbery and tall hedges line the walkway, creating walls of green that flank beds of bright flora. Fountains pour out clear water that glints in the sun, cascading like icicles ripped from rooftops in the winter. There are areas reserved strictly for children, areas with cafes, an outdoor amphitheatre and a community sports and recreation centre. The overall feeling that I had being in the park was one of peace and serenity. Car horns, sirens, the pounding of joggers’ feet and the wails of children with scraped knees or simply a poor temperament could not be heard in the near silence of the park. 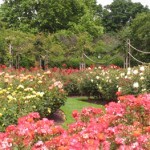 For one who is quick to grow weary of the London hustle-bustle, The Regent’s Park serves as the quintessential getaway. All of the Royal Parks I have visited thus far each have their own distinguishing characteristics, and a unique essence. But don’t take it from me. Hope on the tube and go find yourself some green. As I continue to explore London more and more I realize just how vast and widespread this place is. Before our class took a walk through Southwark on Friday morning I realized I had not even been close to where we were that day. There is so much to do here and it would take years and years to truly get a sense of what all London has to offer. Over the past few days i’ve been trying to conquer as much as London as possible. 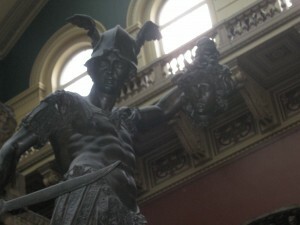 During Friday and Saturday I spent most of my time conquering museums and theaters. I’ll start with museums. 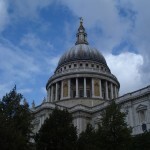 On Friday after our walk of Southwark I headed out to lunch with a fairly large group of people. After our lunch I had a hard time shaking off a bout of sudden tiredness. I figured a trip to the Tate Modern would remedy this. I’m not afraid to admit that I was wrong. Modern art is an interesting beast. As much as I’ve tried still I have a hard time understanding it. Despite this statement in no way am I critical or judgemental of anyones work. As someone who has basically no experience/background with modern art I have no right to say anything negative about someone’s art, I simply just can’t grasp it. Walking around through the first few galleries of the Tate Modern I wandered, I sat, I stared, but still found nothing. I asked Brandon his opinion about some of the artwork and this helped. Talking to someone who has taken classes in the subject and is passionate about it was definitely a good choice and I learned a lot but after some more musings I still found nothing. Perhaps it was the drowsiness, perhaps it was the absurdly sexually explicit video I witnessed in one section of the museum but soon after entering I realized I had seen enough of the Tate Modern. Since many other people in our class had seen the Cabinet War Rooms and the Churchill Museum earlier in the week I figured the afternoon would be a great time to see both of those. This time I was right. From the moment I entered the doors I had a feeling I would enjoy walking through this dungeon of secrets. Although I would never want to be stuck down there for long periods of time I was amazed at how well intact the war rooms were. As I walked through the narrow hallways I had an eerie feeling that I was sent back in time to the early 1940’s when Churchill used the space frequently during the Blitz to hold meetings and conduct secret business. My favorite part of the war rooms was the tiny room that Churchill put 11 secretaries in. According to the audio tour despite the close proximity to each other he expected immaculate work from every single one of these women and did not hesitate to fire them if they were not pulling their weight. After the tour of the War Rooms I spent a bit of time in the Churchill museum before my fatigue caught back up to me. I decided it would behoove me to head back to my room and rest for a little bit before preparing for the performance of “Troilus and Cressida” that we would be attending that night at the Globe Theatre. After getting off at the St. Paul’s tube stop and scurrying across the Millennium Bridge Brandon, Aidan and I made it to the performance about ten minutes early. Just enough time to catch our breath and prepare for the real ordeal: standing for three hours. Despite my concerns going into the performance in retrospect being a “groundling” was not that bad at all. My feet were certainly a little uncomfortable by the end of the night but being so close to the action on the stage certainly made up for that. 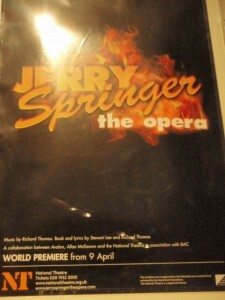 I really enjoyed the performance overall. Matthew Kelly’s portrayal of Pandarus was phenomenal and Paul Hunter (Thersites) left me in stitches for most of the night. While reading the play beforehand I did not enjoy it all that much. It’s amazing how easily and completely transformed a play can become however once performed versus just read. My experience at the globe was great and I hope to go back and see another show before I leave London. Walking back over the Millennium Bridge that night to the beautiful view of St. Paul’s across the Thames I concluded a few things. The first being that London is even more stunning at night than it is during the day. The second being that i’m not going to enjoy everything I see here in this city and I have to come to terms with that. I have been lucky so far on this trip that very few things have disappointed me. I realize I have to be ready to be surprised both negatively and positively with encounters I have, places I go and things I learn. Like everything else in life London is not perfect nor should it be. It’s kind of difficult for me to attempt to describe what the Notting Hill Carnival was like earlier today. It was a complete and utter attack on all of my senses. I could feel the bass drum of the music reverberating throughout my body. I could smell the cooking smoke coming from the food-covered oil-drums-turned-grills. I could taste the spicy, tangy, smoky flavors of my amazing jerk chicken lunch. I could see the countless Jamaican and Trinidadian flags, Bob Marley posters, brightly colored clothing, vividly dyed pink-and-blue hair, and people of every race, religion, age, and size. I realize that most of the people I saw at the carnival are probably tourists. I know that I heard at least four or five different languages, but I don’t think that it took away from the experience of the festival very much. Yes, there were places where you could buy “Imported Jamaican whistles” and Notting Hill Carnival 2009 t-shirts (probably both imported from China…), but the vendors in the center of it all seemed to be, to my unknowing eyes, pretty authentic. Salt fish, jerk chicken, curry goat, and plantains featured heavily on almost every food stall’s menu. Granted, there was the occasional Piccadilly Whip ice cream van and crepe booth, but in this day-and-age, I think that most everyone expects to be able to buy a soft-serve cone at an outdoor festival! The thing that impressed me most about the carnival was how far things have come. When this festival started, it was a protest against the Police force for randomly stopping and searching young black men for drugs and other illegal substances. Apparently the Notting Hill Carnival has been so controversial between the Afro-Caribbean population and the Metropolitan Police that the bobbies tried to have it shut down until just a few years ago. Today I saw a large number of Police attendance, albeit they were doing their jobs, but they seemed to be having a good time. I saw one officer who looked like he’d been in the force when riots were at an all-time-high bobbing his head and swaying his hips to the infectiously happy music. Others were only too happy to oblige tourists by posing for pictures and allowing them to pet their horses. Despite the large number of tourists, I think that this was the best example of cooperation and the new ethnically diverse English identity I’ve seen since I’ve been in London. Thoughts? Yesterday, I stood on Charles Darwin’s grave. And no, it was not in a cemetery or science sanctuary, it was in a church. 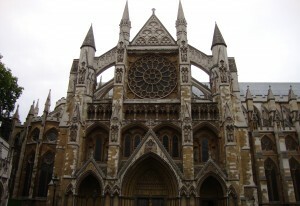 Over 3,000 people are buried at Westminster Abbey. While it is mainly dominated by various royal figures, there are several burials and memorials for literary figures, scientists, and even an unknown soldier. But by far the most shocking person buried there is Charles Darwin. Despite the fact that in many ways his work refutes the teachings of the church, he is still honored there as an important historical figure. This illustrates the importance of English history to the English, to the point where they would rather honor a historical figure who they disgraced with than have his part of history lost. As an English major, there was also another part of the church I particularly liked: poet’s corner. There I saw stones for many writers including D. H. Lawrence, Lewis Carroll, and Dylan Thomas. However, I was disappointed to realize that not everyone who had a stone on the ground was really buried there. I later learned that these stones served mainly as memorials to recognize these artists’ efforts. One the bright side, I did stand on Charles Dickens, who is actually buried in the church next to Rudyard Kipling. All these sanctuaries, memorials, and graves, some with carving or detailed sculptures of the deceased present set me thinking about death rituals. The more we looked at these secularized burial spots , the more they began to resemble the Egyptian burial traditions. My knowledge of their practices is limited, but to my understand the Egyptians bury their dead in elaborate tombs with gold and riches to prepare them for the afterlife. And I looked at the extravagant sculpture of Queen Elizabeth lying about her body I began to wonder what the purpose of this whole thing was. Who was really being honored here? Queen Elizabeth? The artist? The patron or surviving family members? Or even the church itself? And amongst these thoughts, as I walked the tours, the announcement came on for a moment of prayer, it was 11:00. And out of these thoughts of vain royalty, religious celebrations, or tourist attractions, I was reminded that we were in a place of worship, a house of God. And these people were lying here to be with God and to be remembered. These ornate carving and statues were not meant to honor the person, to prepare them for the afterlife, or even to make Westminster Abbey the tourist attraction that it is today; they were made to honor England’s history. Everyday people visit Westminster Abbey and they worship this country’s history. To view a slideshow of photos from my time at Westminster Abbey, The National Gallery, and the South Bank please click here. 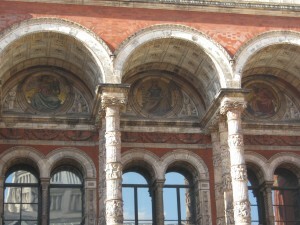 What purpose does the Victoria and Albert Museum serve? Does it have an overall theme? Should it have one? For More on the V&A, read Grace/Kelley’s post from yesterday. I too got a disjointed vibe from the place, but also felt it was quite pleasant. The Museum bills itself as “the world’s greatest museum of art and design”, and while all of the museum’s contents vaguely fit in those two categories, that doesn’t really do the institution justice. A basic exhibit on fashion led to giant Raphael cartoons, which we followed with Iranian and East Asian cultural artifacts and a room so full of medieval sculpture, I thought they might all topple over like dominoes if I were to trip over one. Upstairs we found metallurgy, miniature paintings, and a vague exhibit about modern design. At face value, the V&A looks like leftovers from the rest of London’s great museums thrown together, and yet we all learned things and generally had a good time. In this case, the V&A didn’t need an overarching theme or narrative for its contents to interest us, but I’m not sure I’d recommend it to someone who’d seen a lot of the other great London museums and was looking for something new. Secondly, does the British Museum need to make itself less stuffy? I took another shot at finishing the BM today (maybe next time). One thing I noticed the second time around was that a conscious effort is being made by the Museum to reorganize some of itself along thematic rather than geographic lines. One smaller exhibit Henry, Brandon and I all liked dealt with living with death from a broad and cross-cultural perspective. A sign we caught before we left implied more of these types of exhibits were soon to come. So, what does it mean that after depending on a geographic display of its vast collection with a few special exhibits for its entire history (which the National Gallery and the V&A to some extent do as well), the British Museum has decided to start to make changes. I don’t really know why they are now (anyone have a guess? ), but I think I approve. – I find it hard to picture one of the wealthiest parts of an American city allowing itself to be opened up to the masses for two days of drinking and very loud music. I got the sense that some locals were elsewhere or were fortified in their flats, but most had joined in at their windows or in the streets. People who also went: if you disagree or can think of another reason, put it in the comments.